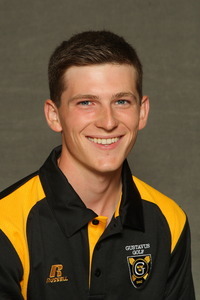 Chris Captain led Gustavus on the weekend with a total score of 152. SAUK CENTRE, Minn. – The Gustavus Adolphus men’s golf team moved up one place during the second day of the Saint John’s Invitational and finished in fourth place out of 20 teams in the team standings. The Gusties shot a 306 on the tournament’s second day at Greystone Golf Club, a two shot improvement from their first round outing at Blackberry Ridge. Chris Captain (So., Rochester, Minn.) led Gustavus for the tournament, finishing with a six-over 152 to finish tied for 15th. Alec Aunan (So., Rock Island, Ill.) was right behind him, finishing with a 153 after shaving five strokes off his first day score of 79 to tally a 74 on day two, and Andrew Krasaway (Sr., Hermantown, Minn.) tied with Aunan with a 153 to give the pair a tie for 18th in the individual standings. Max Savini (Fy., Anoka, Minn.) and Matt Rastetter (So., Maple Grove, Minn.) rounded out the Gustie lineup with scores of 156 and 164 to finish tied for 38th and tied for 77th, respectively. Matt Spier (Sr., Prior Lake, Minn.) led the Gustavus Black team with an eight-over 159 to finish tied for 51st. Saint John’s University earned the tournament championship, finishing with a total of 591, seven strokes ahead of second place University of St. Thomas.